Strawberry and Rosemary Scones | ...and another cup of coffee. I came across this recipe and thought was an interesting flavor combo. I really was hesitant because of the rosemary and strawberry…but the end result really worked great! Just a heads up, these scones are not sweet at all, which is not always a bad thing. My husband said they remind him of a biscuit but my 4 year old thought they were so good she thought it was a dessert. Place an oven rack in the middle of the oven. Preheat the oven to 375 degrees F. Line a baking sheet with a Silpat or parchment paper. Set aside.In the bowl of a food processor, pulse together the flour, sugar, baking powder, rosemary, salt, and butter until the mixture resembles a coarse meal. Transfer the mixture to a medium bowl. Gradually stir in the cream until the mixture forms a dough. On a lightly floured work surface, roll out the dough into a 1/2-inch thick, 10-inch circle. 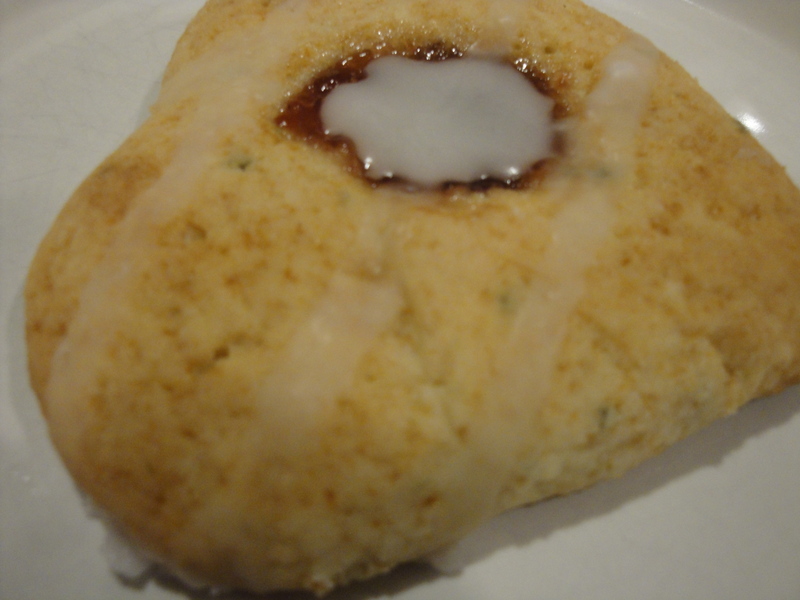 Using a 3-inch heart-shaped cookie cutter, cut out heart-shaped pieces of dough and place on the prepared baking sheet. Gently knead together any left over pieces of dough and roll out to 1/2-inch thick. Cut the dough into heart shapes and place on the baking sheet. Using an index finger or a small, round measuring spoon, gently make an indentation in the center of each pastry heart. Spoon a heaped 1/2 teaspoon of jam into each indentation. Bake for 18 to 20 minutes or until the edges are golden brown. Transfer the cooked scones onto a wire rack. Cool for 30 minutes.